In the first century BC. in various parts of the Abrau peninsula was built at least two dozen monumental stone towerlike buildings. In addition to the early Bronze Age burial mounds, megalithic constructions ‒ dolmens, these structures have become an integral part of the human landscape. There is no doubt that the spread of this building tradition did not happen spontaneously, but it was an expression of an ambitious program, carried out centrally in the Early Roman period by Bosporian rulers in peripheral and border areas of Bosporus state. The question of the date of its construction important is, the period of existence and destruction of these facilities. Creation of Towers-estates on the Abrau Peninsula at Mithridates time back to the time of the end of the 2th–1th century BC. Apparently, one of the earliest buildings of this plan is studied in the vicinity of Gorgippia on of settlement Dzhemete I. According to E.M. Alexeyeva, that house had been built at the end of the 3th century BC and is a typical construction in the territory is clearly laid out the village-coma of second century BC. Similar phenomena are known in the “Islands” (a settlement Jubilee I). 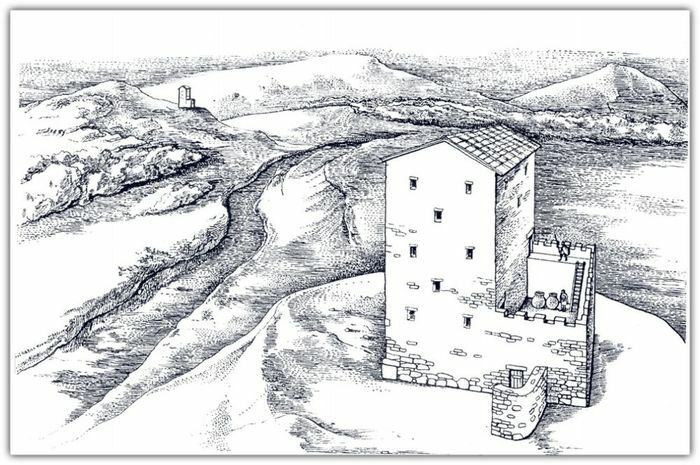 The fortified manor house in the vicinity of Gorgippia (Anapa), village Dzhemete I, as the tower-like structures of European and Asian Bosporus, experienced a defeat at the end of I century BC, probably as a result of the punitive expedition by Polemon I (Strabo. XI. 2. 11; XII. 3. 29). A large part of the fortified mansions in the Abrau Peninsula then survived, the damaged Anapskaya village, had been restored and the system lasted until the middle ‒ third quarter of the 1th century AD (near Khutor Rassvet). The researcher towering buildings in the Tsemes valley – Nadezhda. A. Onayko ‒ she said that had perished as a result of the same events. By assumption, Yu.S. Krushkol, it was a civil war between the Bosporus king Mithridates VIII and his brother Cotys I. Currently available materials confirm this date.